In continuing with our series, another set of "wahala" (problems) faced by Nigerian students comes in the form of a two-headed monster (I made that up. The monster probably has more than two heads. 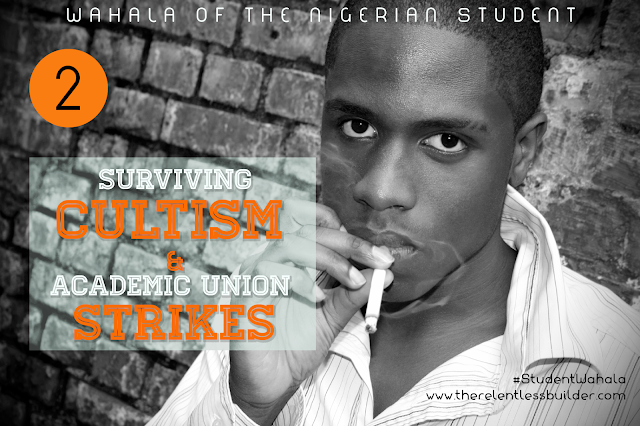 Share a picture if you see it live): Cultism and Academic Union Strikes. This typically affects institutions of higher learning a.k.a universities. Let's tackle them one by one. Now, I personally feel that this definition is too soft and does not adequately describe the horrors and evils that secret cults perpetuate on Nigerian college campuses. As far as I am concerned, secret cults, originally called confraternities, are criminal gangs and should be eradicated. Whatever good purposes they were originally established for (i.e. as social organizations for promising students) are non-existent, and they are now nuisances. Cult clashes are terrible and usually leave a bloody trail behind. Last time I checked, these were all crimes, which makes secret cults just a conglomeration of organized criminals. Some universities are known to have more dangerous cults than others. Since we all know secret cults are evil, why do they thrive? My answer is this: Because they are supported financially and otherwise by men and women in high places. These politicians, businessmen and women, leaders may or may not be alumni of these cults, and they patronize them to get rid of competition. Ironically, private universities and colleges which were established partially as an alternative to the "cult-infested" public universities and polytechnics are also known to harbor secret cults as well. I think if cultism was eradicated, that alone would make a huge difference in Nigeria's educational system. Students should not have to study in fear or have their lives truncated prematurely because of these criminals. "X" stands for the number of extra years a student will spend beyond the official 4 or 5 years allocated for an undergraduate degree program. The reason for the unnecessary delay? STRIKES. Both the academic (ASUU) and non-academic staff members are poorly paid, and regularly go on strikes to force the government to meet their demands. While the strikes are not always successful, the major victims are the students, who are forced to leave the school premises and stay at home indefinitely. Strikes can last for months and those months add up to years eventually. The crime rate increases: "An idle mind is the devil's workshop" takes on a literal meaning. Female students come back pregnant and/or married. I think that is pretty self-explanatory. Question: What is your take on secret cults and ASUU strikes? Speak your mind.